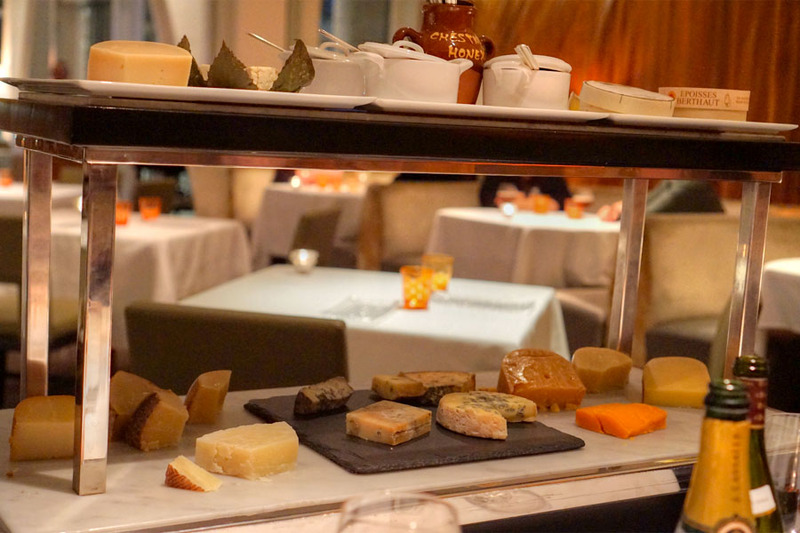 We recently paid a visit to Patina, Downtown's longstanding temple of fine dining. It's almost become a tradition of ours to dine at the restaurant each time there's a changing of the guard in the kitchen, and the latest top toque is Executive Chef Andreas Roller, who took over in early 2017. About the Chef: Roller was born and raised in Germany's Black Forest, the son of restaurant professionals (dad in the BOH and mom in the front). He began cooking in his teens, and from 1994 to 1997, apprenticed at Harald Wohlfahrt's Michelin three-star Schwarzwaldstube inside Hotel Traube Tonbach. This was followed by two years at the two-star Restaurant Speisemeisterei in Stuttgart, under Chef Martin Öxle. He relocated to SoCal in 2000 at age 23, and landed a sous chef position at the original Patina on Melrose, which was helmed by Walter Manzke. In 2001, Roller cooked on board the MS Europa, the "best cruise ship in the world" according to Berlitz, then moved to Mosimann's Belfry in London, a private dining club run by Anton Mosimann (formerly of the two-star Dorchester). In 2003, he worked at Wolfgang Staudenmaier's Ristorante Da Gianni in Mannheim, the first Italian restaurant outside of Italy to be awarded two Michelin stars. The Chef then started catering, serving over 20 Formula One Grands Prix, the 2004 Summer Olympics in Athens, and the 2006 World Equestrian Games. During this period, he also received his Bachelor's degree in hotel management and marketing from the Fritz-Gabler-Schule in Heidelberg (Germany's oldest hotel management school), attained his Master Chef with honors certification from the Deutscher Industrie- und Handelskammertag (the German chamber of commerce), and worked at Hotel Zürserhof in Austria. 2006 saw Roller at the Burj Al Arab in Dubai and at Guillaume Brahimi's acclaimed Guillaume at Bennelong inside the Sydney Opera House. 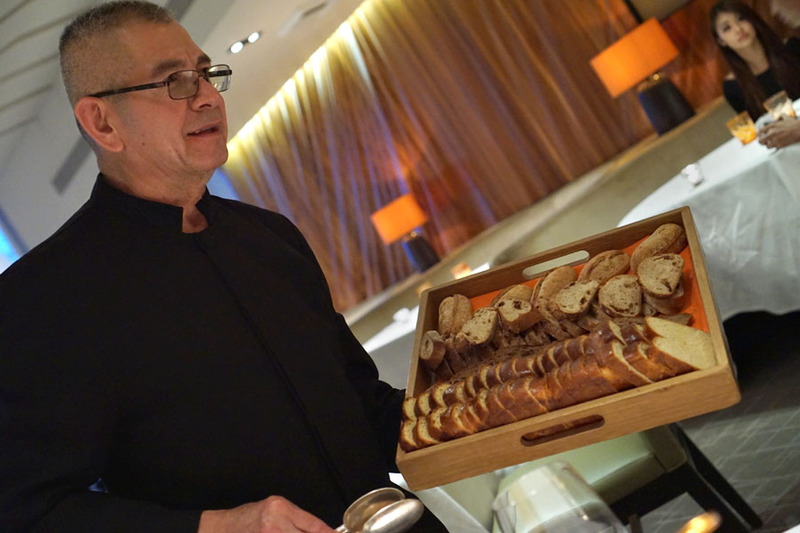 He returned to PRG in 2007, and has basically served as Joachim Splichal's culinary right-hand man for the past decade. For 10 months from 2011 to 2012, he was interim Exec Chef at Kendall's Brasserie (replacing David Féau), then took the reins at Nick & Stef's Steakhouse before replacing Paul Lee here at Patina (Lee had apparently moved back to Asia to open his own spot). The FOH is the duty of GM/Water Sommelier Martin Riese. A fellow German, he came up in the northernmost part of the country, and started out as an apprentice at Hotel Stadt Hamburg on the island of Sylt. Following, he worked with Josef and Anton Viehhauser at Viehhauser im Hafen-Klub, and in 2001, did a stint at Eckart Witzigmann's Ca's Puers in Majorca. He made his way to SoCal in 2002, joined PRG, and worked at the original Patina, Patina Catering at the Hollywood Bowl, and Nick & Stef's in Washington. Riese then returned home, spent some time at Alter Meierhof in Glücksburg, and landed a position at First Floor at Hotel Palace Berlin in August 2005 (where he would meet his wife). He stayed for six years, during which time he was promoted to maître d'hôtel, received his water somm certification, and co-wrote Die Welt des Wassers. In September 2011, he returned to PRG and joined Ray's and Stark Bar. Riese transferred to Patina in 2015, becoming GM in December 2016. Inside, things really haven't changed much since my first visit 11 years ago, but they don't need to. It's a comfortable, civilized space. Patina's menu can be described as globally-inspired contemporary French, and comes in three formats: three ($105), seven ($150), or ten ($200, off-menu) courses. To drink, there's a small array of cocktails, a few beers, and of course the restaurant's (in)famous water list, which features more than two dozen options. The main draw, though, should be the wine list (not pictured, because it's huge), which is no doubt one of the most serious in town, with a particular strength in its Californian and French selections. Corkage is a not-too-bad $30, and was waived tonight (as we did purchase two bottles after all). Click for larger versions. Wine-wise, it just felt right to begin with some Champagne. 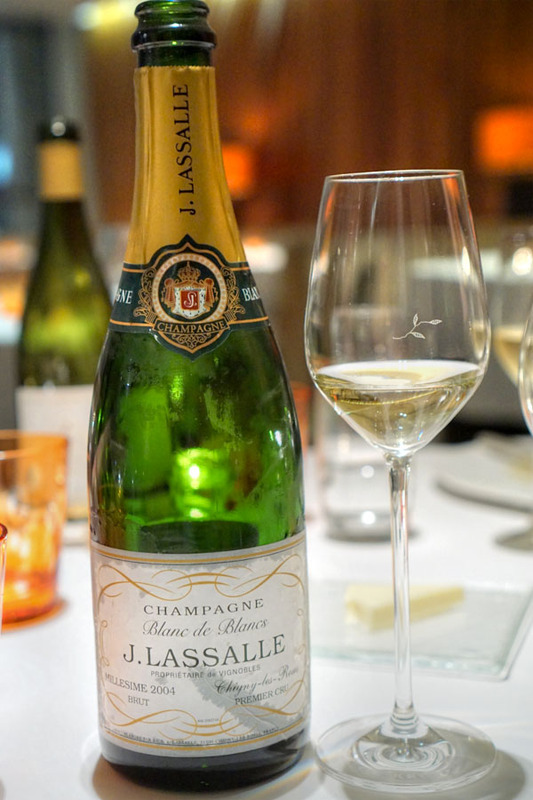 The Jules Lassalle, Brut Premier Cru, Blanc de Blancs, Chigny-les-Roses, 2004 [$155] showed off appealing aromas of toast, lemon, and juicy apple. The palate was crisp, vivacious, yet still mature, with an oxidative bent and more of that delectable fruit character alongside citrus and yeast. A superb start. 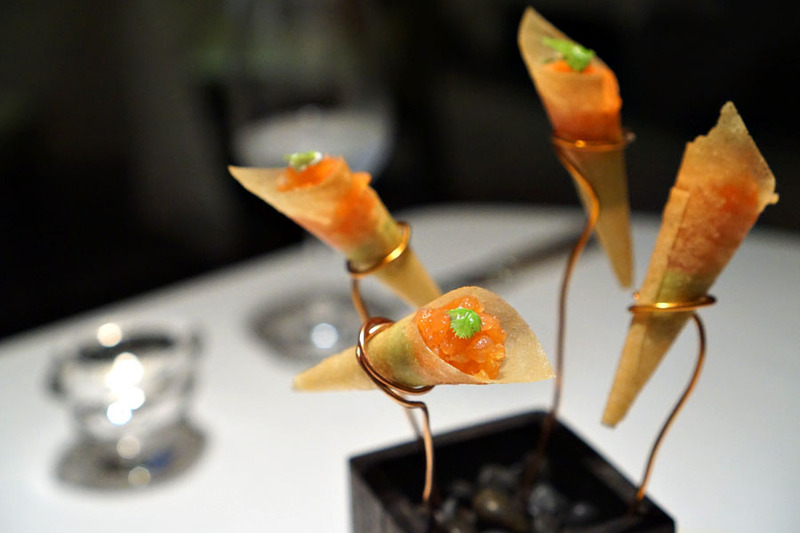 Amuse bouche duties were handled by corn trumpets stuffed with smoked salmon, avocado mousse, and lemon crème fraîche. I definitely got a smokiness and salinity here, but those notes were evened out by those crispy cones and the bite's creamy, tangy flavors. Our friendly bread server provided four varieties tonight: a lemon-y, pound cake-y brioche; a spicy, nutty Patina rye; a soft, fruity fig; and a prototypical seven grain. Butter, meanwhile, was as soft and sweet as I wanted, and came from Kansas City apparently. 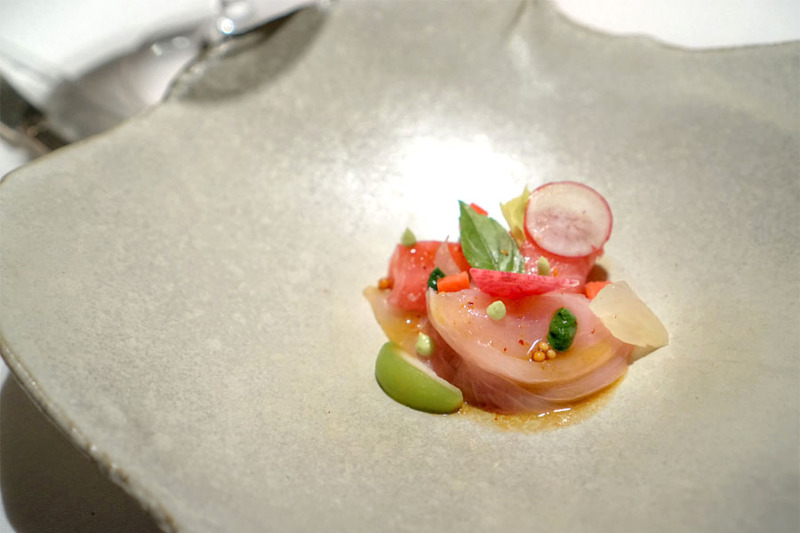 A duo of crudo was marinated in sudachi, then served with avocado mousse, Thai basil, Japanese peach, oroblanco, tangerine, and radish. 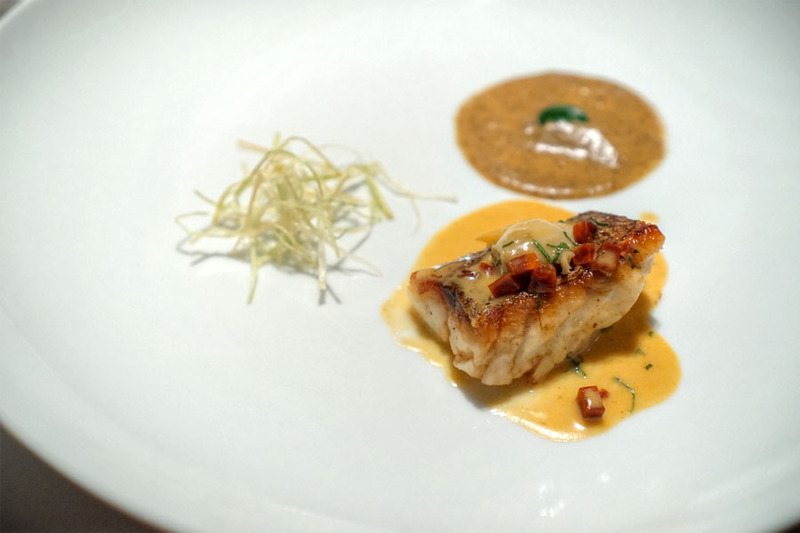 It was pretty great, the dense, meaty cuts of fish conveying a fattiness, savoriness, and brine that matched beautifully with the bitter notes in the dish. I got some excellent finishing accents from the celery and minty basil, too. 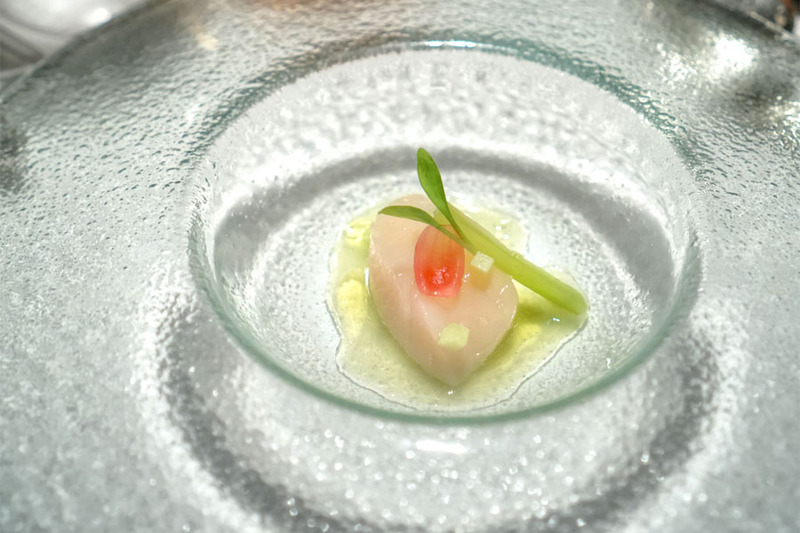 A supple medallion of scallop had its ocean-y flavors matched by the acidity of an aguachile-inspired broth while lime and cucumber provided further contrast. Also appreciated was the course's lingering, herbaceous finish. However, I would've liked some heat here, since the traditional dish is rather spicy after all. 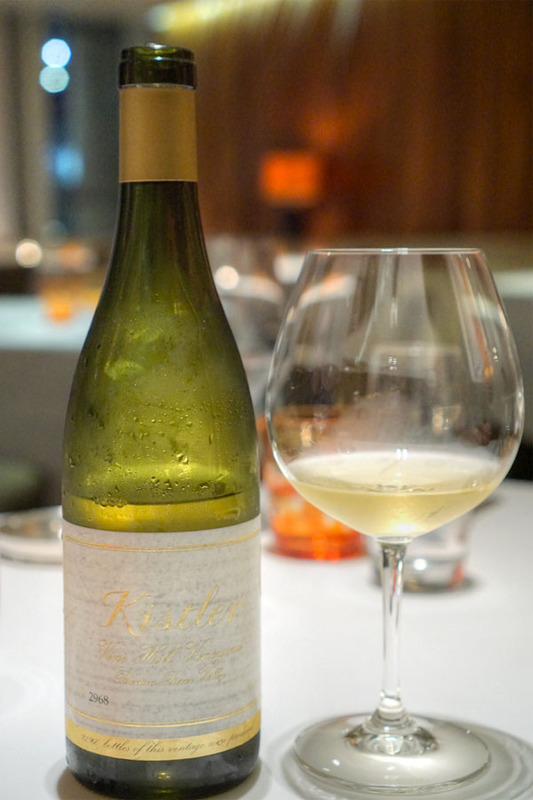 Our next wine was a Chardonnay that one of my dining companions brought, the Kistler, Vine Hill Vineyard, Russian River Valley, 2015. This was lovely as well, smelling strongly of vibrant fruit, but with a somewhat musty backing. Taste-wise, I found it rather hardy, with an oakiness giving way to herbs and more tropical-ish fruit on the back end. Asparagus arrived stout and sturdy, its juicy, bittersweet flavors perfectly matched by a combination of woodsy morels, bright peas, and lush poached egg, the whole thing bound together by a rich brown butter sabayon. Furthermore, said sabayon was really amplified when we had the dish with a sip of the Kistler above. A table favorite. 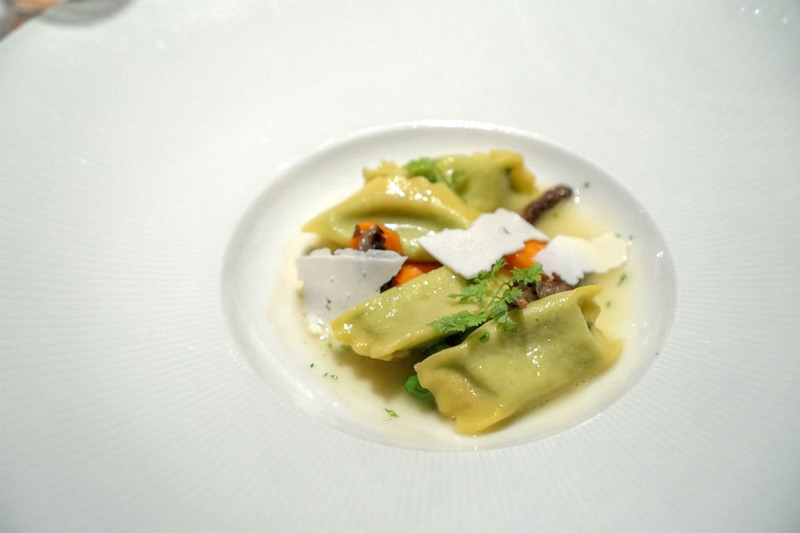 The agnolotti was another standout for me. I loved the sheer butteriness of the dish at the start, but this transitioned seamlessly to the robust, refreshing flavors of pea purée. I was a fan of the ricotta here as well, as it imparted a sharp saltiness to the mix. 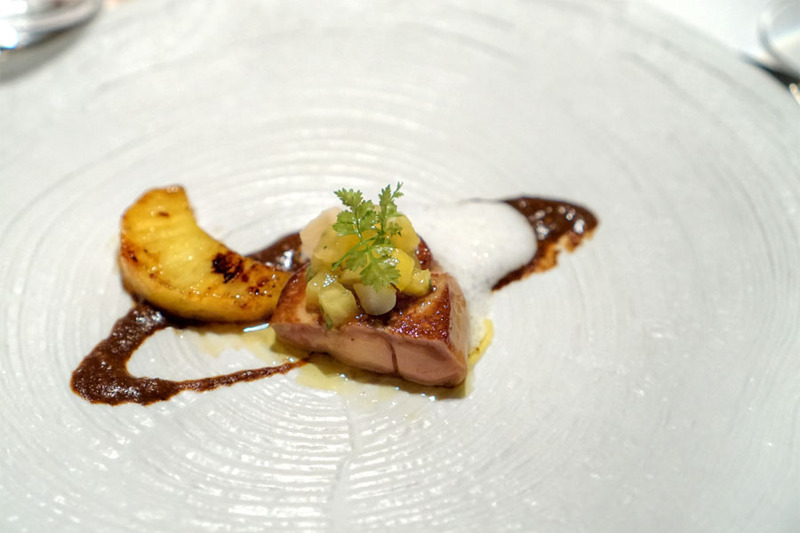 Seared foie gras was just what we expected: silky and melt-in-your-mouth, with a rich, earthy taste that demonstrated both potency and restraint. A combo of grilled pineapple, coconut foam, and pineapple-mango salsa provided your requisite fruity notes, but more interesting was the dish's mole-inspired sauce, which offered up a nuttiness that I quite enjoyed. A bit of a multicultural mash-up, but it worked. Pan-roasted sea bream was very tasty, with a delightfully crisp skin to boot. Clams kicked up the brine factor in the dish while chorizo imparted saltiness and spice, and overall the flavors meshed together quite well. Garnishes, meanwhile, included deep fried leeks, a Vichyssoise(?) purée, and a watercress purée. In addition, I will say that course seemed to draw out the minty qualities of the wine below. 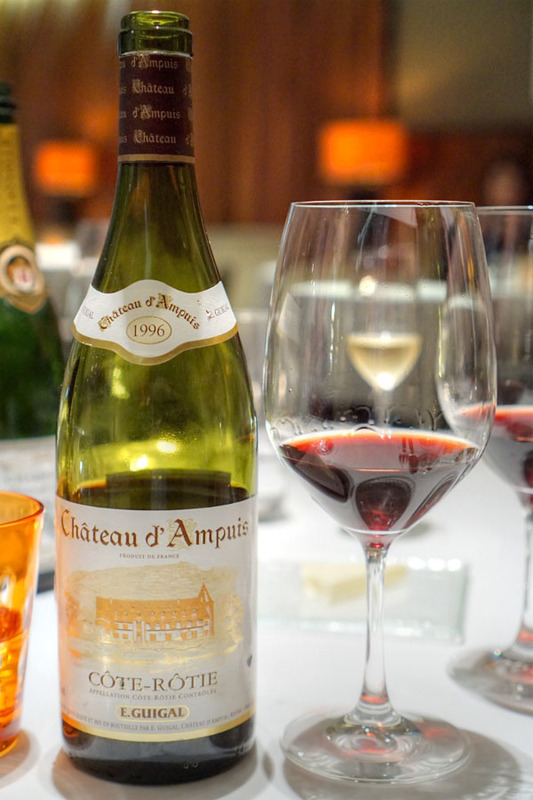 The evening's final wine was another winner, hailing from the Northern Rhône: "Chateau D'Ampuis," E. Guigal, 1996 [$195]. Vigorous nose showcasing meat and mint alongside berry fruit. The palate was similarly powerful, with notes of pepper, leather, bramble, and olive coming together in wonderful harmony. Some may say that this wine is past its prime, but we all agreed that it's drinking very well now. Note that we chose not to decant. Our final savory had grilled sirloin and braised tail accompanied by Japanese pickles, spinach purée, and a potato mousse with Parmesan dough. 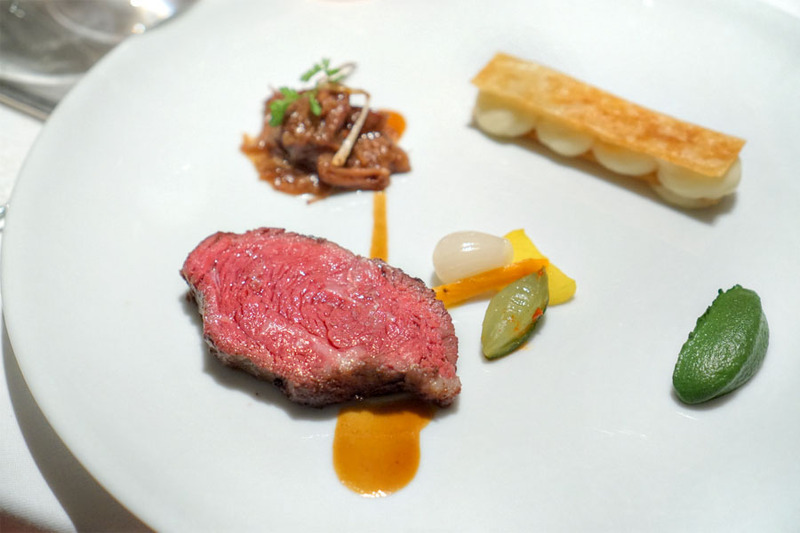 The wagyu was assertively flavored for sure, while the oxtail was as dark and decadent as one would expect. Fortunately, the pickles managed to provide balance to the dish, and we were all rather smitten by the potatoes, too. Époisses - Think rich and runny, with unabashedly salty, pungent flavors and a sweetness underneath--all things that make this one of my favorite cheeses ever. Fourme d'Ambert - I found this relatively subdued for a blue. It didn't possess the sharp, salty nuances you might expect, though it did have a funk that crept up on me. Etorki - A sheep's milk varietal from the French Basque region, this was a somewhat "sticky" cheese with a mild, slightly sweet taste. O'Banon - A goat cheese wrapped in chestnut leaves and washed with Woodford Reserve, from producer Capriole in Indiana (based on the traditional French Banon, which is rinsed with eau de vie). Dry and dense texturally, this had a light, tannic flavor profile with traces of citrus and herb. Beemster Classic - Aged for 18 months, this gouda-like cheese from the Netherlands displayed a firm consistency with some crunchy crystallization. Taste-wise, I got salty, caramel-y notes with a bit of nutty brown butter. 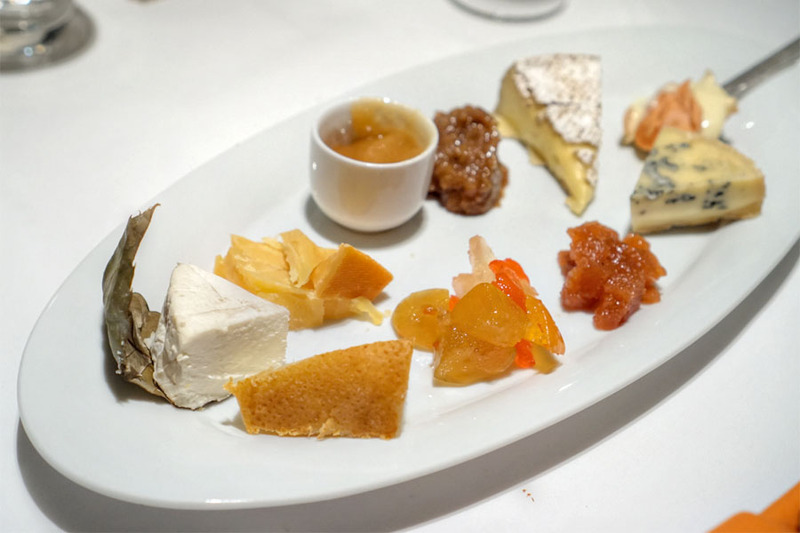 Brie - Soft and luscious and oh-so creamy, just as expected, with flavors that were milky and mildly mushroom-y. 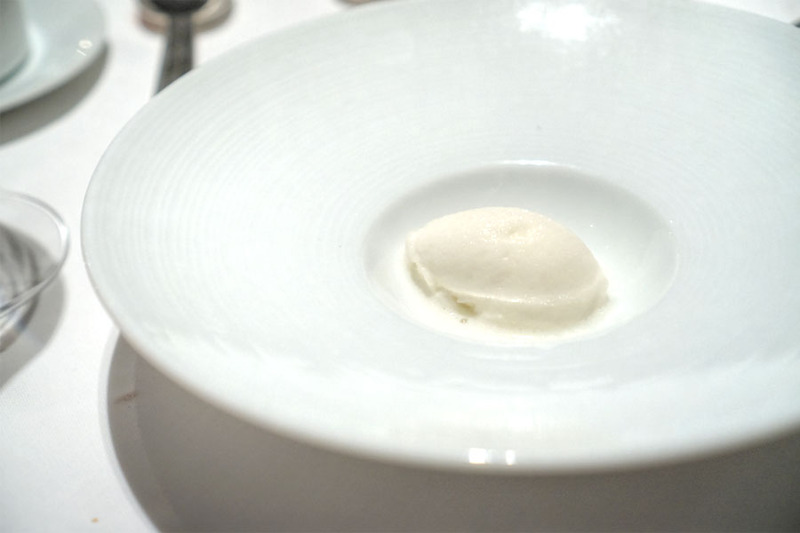 An intermezzo course comprised a small quenelle of bergamot sorbet. Intensely floral to the smell, it was bitter and sour and bracing, and thus quite effective as a palate cleanser. 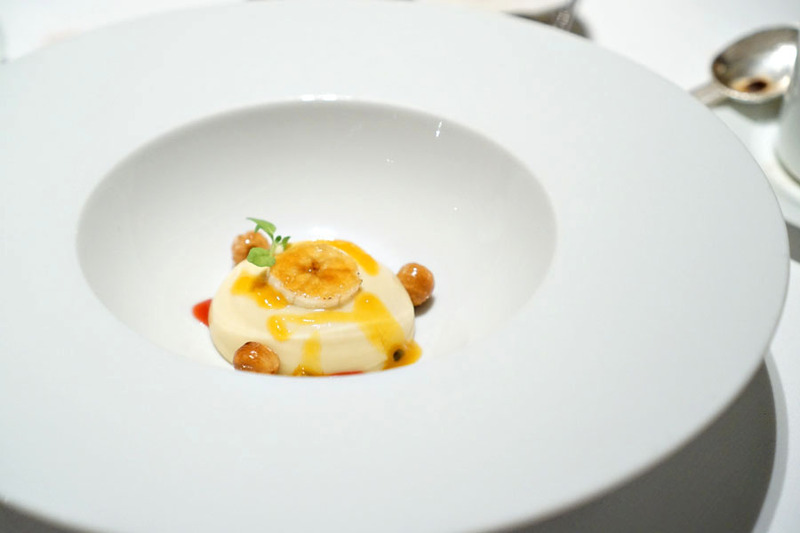 Our first proper dessert featured a white chocolate mousse drizzled with passion fruit coulis and accompanied by caramelized hazelnuts and banana. I got a fruitiness here that sort of formed the main thrust of the dish. The nuts worked as a crunchy counterpoint, and the hint of mint on the close made sense as well. 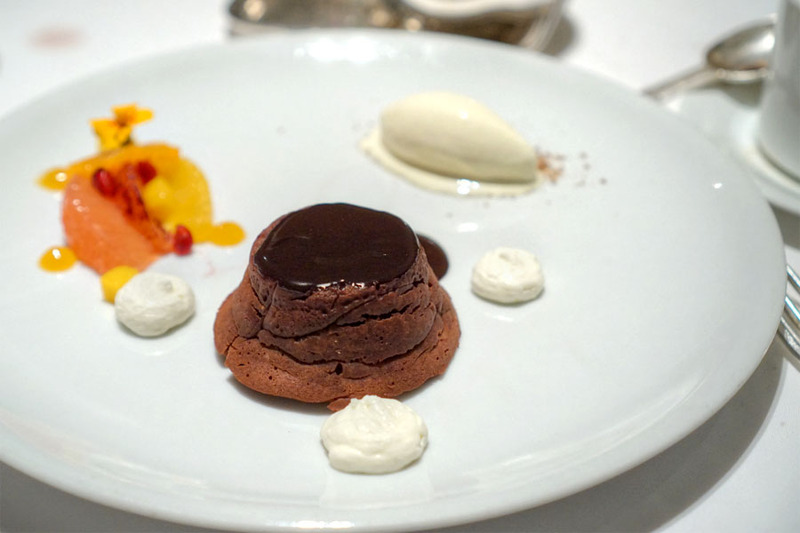 Here we had a chocolate cake that was like a cross between a soufflé and a moelleux au chocolat. Its flavors were on the heavier side, so the citrus, St-Germain-infused whipped cream, and zesty ginger ice cream were absolutely crucial for balance. 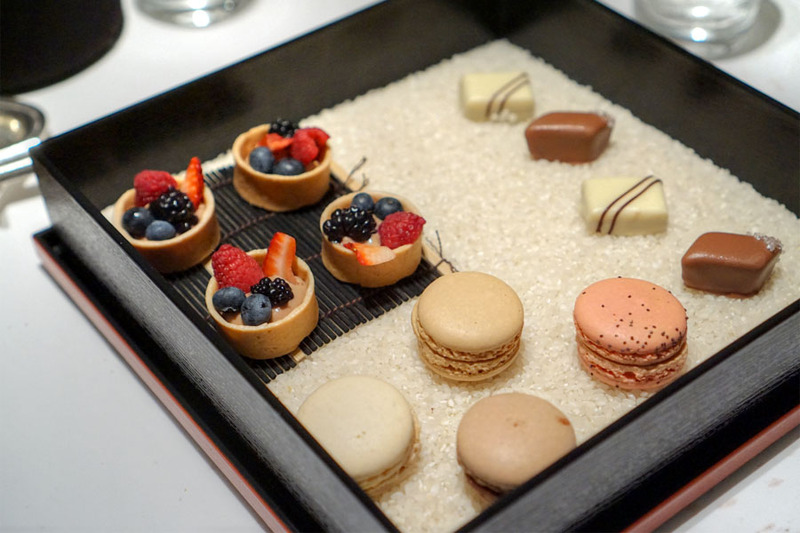 We ended with a collection of petits fours. The macarons were quite nicely textured, and I was able to sample one flavored with what I believe was tea, while another combined chocolate, orange, and perhaps ginger. Miniature fruit tarts hit the mark with their mix of creamy and fruity elements, all contained in a buttery crust. Last up were bonbons in two varieties: salted caramel and cookie crunch. Roller is just the latest in a long line of chefs at the helm of Patina, and looks to be doing a good job so far of steering the ship at this storied restaurant. 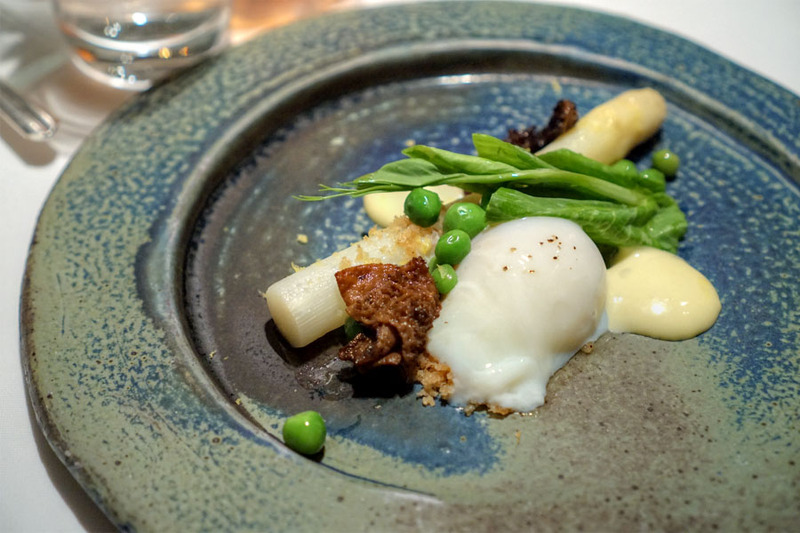 There's definitely an old school fine dining sort of vibe to the place, which is part of the appeal for me, yet the cooking's seemingly both contemporary and familiar at the same time. Patina's pretty much achieved grande dame status by this point, and is far from the talk of the town, but I really do hope that it sticks around for a long while. I just had to Google the Sommelier's name to make sure you didn't go all Freud on us. Really like Roller's food. We do some wine dinner's at the chef's table. They flew in Guinea hen from the east coast and roasted it stuffed with black truffles earlier this year. Divine dish. Nobody wants to see your ugly Chevy Trailblazer. Keep that hideous car hidden in your garage.